The 12th Annual Super Sunday Run took place on Super Bowl Sunday. It goes without saying that this was a cold day. The temperature was in the 30’s with a nice breeze off of The Charles River. You can almost see the river from Race Central. This neighborhood of Cambridge is home to The Broad Canal which runs right beside Race Central. The Broad Canal is one of the last remnants of a once extensive canal system that Cambridge was known for. In the summer the canal is a popular gathering area. People like to get lunch and hang out near the water. There is also a kayak and canoe rental business that has become very popular. In the winter the wind off of The Charles whips strait up the canal. Fortunately, Race HQ was in a tent with sides. All of the people packed inside built up enough body heat to keep it warmer than the ambient temperature. Bib and swag pickup was in here. After the race, awards and the band and a DJ were in the tent. The Melrose Running Club had 31 runners and three volunteers at this race. The races were part of our Melrose Racing Series for the first time this year. We always have a few runners at this event, but this year the turn out was unbelievable. The races raise money for cancer research and we had two cancer survivors on our team, including team captain Judy Dolan. Judy did an awesome job promoting the race to our club and got a huge crowd to show up. You may have noticed that I keep saying races. That is because this event incorporates a 5K and a 5 mile race. Our club had 8 people run the 5K and 23 run the 5 Miler. Over all about 1400 people ran the races. 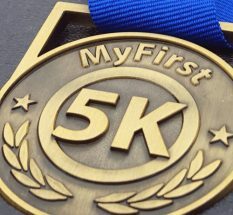 In 2015 I ran the 5K and I’ve run the 5 Miler each year since. 5 Mile races are rare so I like to run one when I can. It’s 1.9 miles longer than a 5K and a good way to push the 5K pace a little longer. Since we had a VIP tent, we had a place to gather and stow our gear. Judy brought a coffee cake and a nice card and chocolate for everyone. Someone else brought banana bread and the race gave us 2 cases of Body Armour sports drink. I picked up most of the numbers on Wednesday after work and Zelia Magliozzi picked up the rest on Saturday. It was a team effort. As people showed up I made sure they got the right bib and any raffle tickets or t-shirts they purchased. Just like the bib pick up, it was a bit chaotic but we managed. I only ended up with one extra shirt that no one has claimed so far. Then each runner had to pick up their race swag in the Race Central tent. Before I did the bib pick-up I thought swag was just hat or gloves. Turns out there were several different hats, a neck gator and bottle opener in addition to three sizes of gloves! I took a few photos before the race but they didn’t come out very well. Around 9:45 we headed for the starting line. As we headed over the crowd seemed light. I thought maybe people were hanging out in the warm tent or parking garage lobby. Walking down Athaneum Street I could see about 100 runners lined up behind the start. There were another hundred or so milling about looking a bit lost. I knew which side of the start line to head to and lead the gang down the street. It was so cold that I kept my Cambridge Marathon jacket on! I didn’t see anyone else from The MRC at the start line, so I stepped up to the front. I was standing there next to twenty-something year old guys in shorts and singlets. Some of them gave me the impression they didn’t like the old dude muscling in on their start line. I chatted up everyone around me. About 5 of, Alain came to the start with his mic and told everyone which direction the race was going in and that we had a 5 Miler to get started. I was determined to have a purple Melrose Running Club singlet in the start line photo, so I unzipped my jacket. It was cold, but I had to take one for the team, or club. I heard some commotion behind me and turned to see a wheel chair racer making his way through the crowd. Alain said he was the first wheel chair racer ever to do a Super Sunday race. To give him time to get down the street Alain was going to start him on a verbal command one minute before the 5 milers. I’ve only started one other race this close to the front. In that race I kept up for about 100 yards and it was all over from there! This time I was one person from the line and before I even crossed the line I was further back in the crowd! I was running with the big dogs! Before we made our first left onto 3rd Street a hundred people had passed me. I knew this was going to happen but the idea was to make a good showing for the club. I kept the after-burners on for as long as I could and mile one came in at 7:28. I knew that was unsustainable so I consciously backed off a bit. The road was nice and flat, but the first mile of energy was gone. I was in real running mode now. So many people were properly dressed and here I was in a heavy running jacket. I even forgot to double tie my laces. What a mess I thought. Mile two clicked in just before Harvard Yard and our turn around. I grabbed a water at the water stop because I felt like I was going to need it. I managed a marathon gulp and didn’t loose much time. Mile two was 7:38. Not bad. Had I managed to only loose 10 seconds or had I managed to hold my self back by 10 seconds? And what the hell was I thinking? Over dressed, over weight and out of shape. Damn the torpedoes and full speed ahead! It was a bit of a relief to be turned around, but we had only run two of five miles. Not even half way, wise guy. I knew I had to save a bit of juice so I wouldn’t flame out. We were now running east on Cambridge Street. I was amazed at how many bars, restaurants and shops of every variety I saw. It was block after block of interesting places. I may have seen one or two vacant store fronts. We hit half way mark near The Cambridge Hospital and I still felt okay. I’ve become pretty obsessed with my watch this past year or so. I’ve always paid attention to it, but now I check it much more often. When I ran Honolulu in 2017 the habit locked in. I was under-trained for that race and my strategy was to run even splits at my goal pace. It kind of worked, but that’s another blog post. For the Super Sunday 5 Miler my goal was to run as fast as I could, just not under 7:30! That was working out pretty well as mile three came in at 7:44. My goal was under 40 minutes so I had built in some cushion over the first three miles. We were now at the 5K mark and I think they had a timing mat. I know I saw a timing mat out there somewhere. I think I did. It could be interesting. Mile four chimed in at 8:05 just after we turned right onto 1st Street. One mile to go! I certainly didn’t have any kick left for the end. The 5K runners had joined up with us around 3.5 miles. They were running a bit slower and some had young children with them. I saw a few people walking, but most of them seemed to be with children. Everyone around me seemed to be running comfortably. The caliber of runner in the 5 Miler seemed quite high. There were some super fast runners who I started with and there were solid 7:30 runners hanging with me now. There wasn’t a lot of passing going on anymore. A few hot shots would shoot by us, but where the hell had they been all this time? 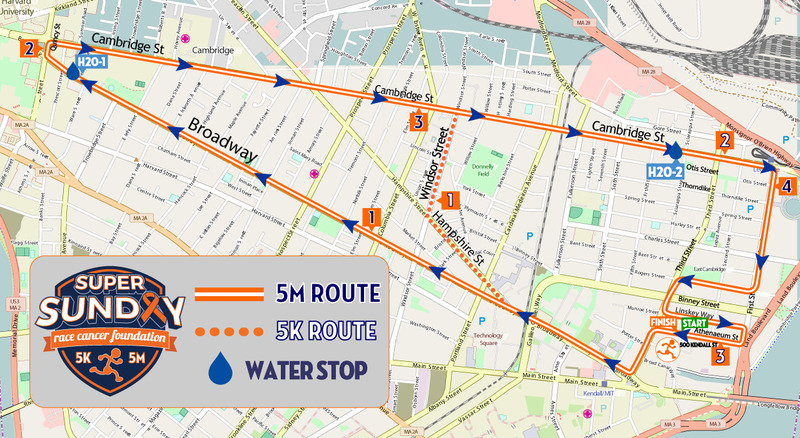 First Street runs behind the Cambridge Gallaria Mall and Lechmere Canal. It was still early Sunday morning, but we had a few drivers backed up. I knew we were close because I knew the neighborhood and was checking my watch. Part of me hoped the race was marked short! How many turns were we going to make in order to get to five miles? We took a right onto Rogers Street for two blocks and then took a left onto 3rd Street and crossed Binney. Then we took a left onto Linskey Way. As we crossed 2nd Street I could see runners headed down Athaneum Street to the finish line. At the end of Linskey we took a right back onto 1st Street and passed The Athaneum building and immediately took a right onto Athaneum Street. Now I could see the finish. I really didn’t have any juice left for a kick so I just kept on pushing anyway. The finish area was pretty clear. There was only a small crowd and I didn’t see anyone I knew. As I approached the finish line I could see that the clock still had 38 on it. As I passed the clock it still had 38 on it! I had beaten my goal by more than a minute. I jogged down the street a bit and saw Mike Sikkema. I later found out that he had finished in 29:54 at a 5:58 pace! Smokin! And I don’t think it was even a PR for him. As we talked and walked back towards Race Central we saw Dorota Bulik cross the line. She didn’t hear us call to her and we were getting cold so we kept heading towards the tent. Dorota finished in 38:18 and was Team MRC’s 2nd place finisher. Mike was first. To her surprise, Dorota won her age group! The great thing about having a VIP tent is that it gives everyone a gathering spot. Slowly everyone came to our tent and the fun began. Everyone had a good run and a good time. The course is on good roads and is has plenty of police details to keep things safe. The beer tents were on the other side of the plaza so Durm Cahill and I headed over. Mighty Squirrel and Sam Adams were pouring. The line for Mighty Squirrel was very long and the line for Sam Adams was not. I got a Sam Adams Lager and a Sam 76. Both were cold and tasted great. When we got back to the tent Thuy Dang took one of my beers and headed for the beer tent. I thought she just wanted to try it, but really wanted a beer to drink while she was in line. She came back with two beers and gave me one. After a while they came around with three pizzas for each tent from Za. They were hot and tasted great. We opened one pizza at a time to try and keep them hot or at least warm. I think everyone got a few slices. We had a lot of fun comparing notes and enjoying each other’s company. Slowly people trickled away to other obligations. Mike Sikkema actually ran 10 miles back to his home in Melrose! He had to get those miles in. I made a few trips to the beer tents and eventually made it to The Mighty Squirrel, but I don’t recall which beer I had. It was good though. I also managed to get some buffalo wings from Miller’s Ale House. They were hot and spicy, just the way I like them!